this is Lilith or Lilitu. 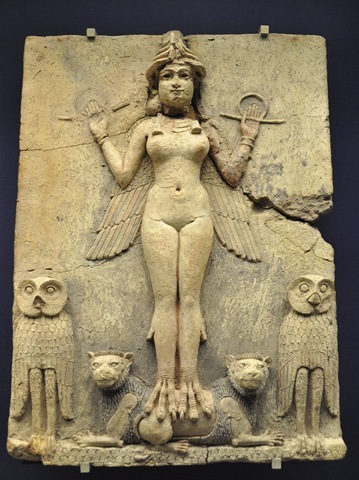 some scholars say this plaque is really of Ishtar or Inanna. in my opinion is Lilith is to Inanna as Kali is to Durga, and the Morrigan is to Macha or Badb. and this plague is entitled the queen of the night. and that is Lilith’s title. it said that Lilith was originally an semitic goddess that was demonized by summerians later the babylonians. she was worship by the akkaidians and the semitic tribes in arabia and southern area of mesopotamia. then the akkaidians disappeared. and the semitic tribes were absorbed by the summerians. so when you think of Easter. it is not just Ishtar or Inanna that was worship on this day. it was their sister Lilith or Lilitu that was also. and Lilitu became the Hand of Inanna later on.